Osaka was the first and final stop of our Japan trip. After another shinkansen ride from Nagoya to Shin-Osaka, we took the Midosuji subway Line to Dobutsuenmae Station, which is the nearest station to our hotel, Hotel Chuo. A glitch on this subway station is that there was no elevator! In short, 3 flights of stairs with heavy luggage. Anyways, after leaving our bags in the hotel for storage, we were starving and upon one of the guests recommendation, we made our way to Osaka’s food haven, Dotonburi. 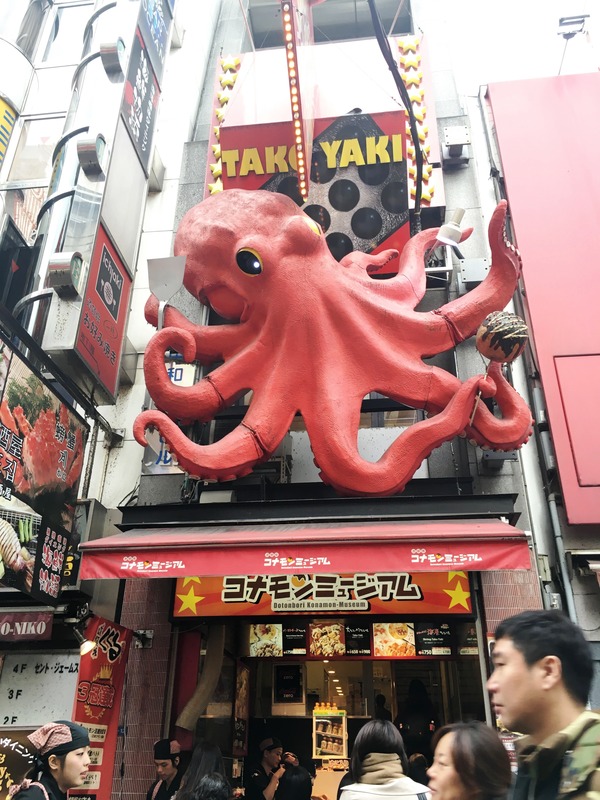 Dotonburi is definitely one of the must-go places in Osaka. Once well-known as a theater district, it is now a popular nightlife and entertainment area characterized by its eccentric atmosphere and large illuminated billboards. First things first, we were starving and need food, asap! There were food signs everywhere and we were a bit overwhelmed by it all so we ended up choosing something familiar, Takoyaki! 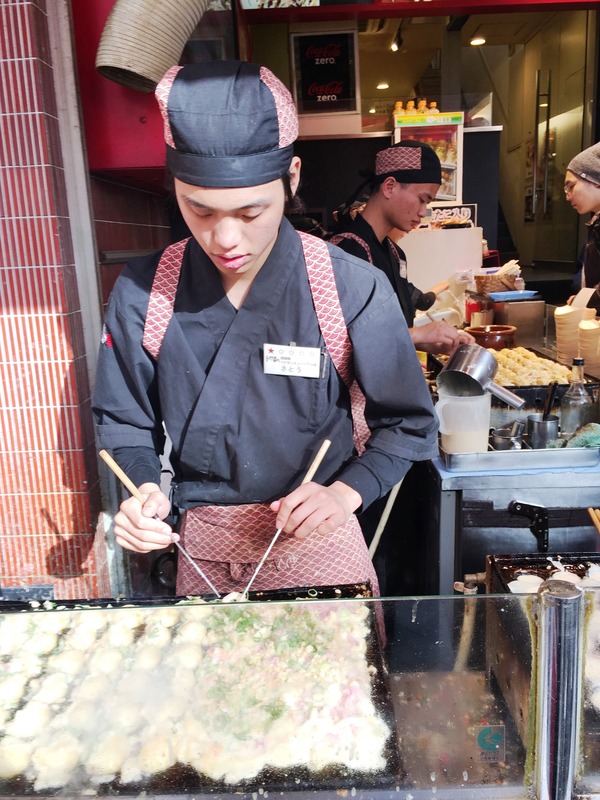 The first time I’ve tried takoyaki was in a food cart inside SM and it’s safe to say it put me off eating this food after that. I only remember that the version I had only has vegetables in it (majority of which was cabbage). Needless to say, I was in for a culinary shock when I finally got a taste of the real thing. Having satisfied our hunger, we were more clear-headed on our next food stop choices. While walking along the street we decided we can still take one more snack (or two) before we can move on with desserts. We found a shop that sells Okonomiyaki and doesn’t have a lot of people queuing so we headed inside and they directed us to the top floor dining area. We ordered Pork and egg Okonomiyaki and Yakisoba (hey, i said 2 more :D) that we shared among us. After that meal we walked for a while then decided on buying dessert from Family Mart. With our stomachs full and happy we decided to find a cinema so that we could watch the new Star Wars movie. Just next to Dotonbori is Shinsaibashi, the shopping district in Osaka. We were supposedly going to Namba Parks Cinema but upon walking along Shinsaibashi, we passed by Toho Cinemas and decided to go there instead. It is on the 8F of the building with department stores on floors below it. We bought our tickets (through a vending machine!) and still had time to spare before the movie starts so we decided to look around the shops. see the green Dragon figure? *Photos taken using iPhone 6s, Xiaomi Yi Action Camera and Nikon d3000. Chasing the sun. Shooting for the stars. Live to travel to live.